Upon request, Gunthorp will schedule special classes at your convenience for your group and travel to your location. Contact us for details. Special introductory group classes for women only are available. A variety of pistols and revolvers are available to handle and shoot in a relaxed, safe environment. Multi-state permit to carry: The limit is 6 students with 4 hours class instruction including range time. The class fee is only $100 in advance or $125 at the door, if space is still available. This class allows you to apply within one year for any or all permits issued by MN, FL, or WI. A large selection of defensive handguns and holsters will be displayed in the classroom. As a Federal firearms dealer, Gunthorp also can assist students with $20/firearm transfers and purchases at wholesale pricing. Please see general instructions below. Saturday classes at Island Lake are on an ongoing basis. Please call for a special class at your convenience. Upon space confirmation you may pre-pay the discounted class fee of $100. Please mail non-refundable class fees or pre-pay online to reserve your seat. If you need to cancel, contact Gunthorp in advance for a replacement class. Both Advanced and Expert classes are all day Sundays at a remote range. Please contact us to be placed on the 2019 waiting lists. For more information about the next scheduled class please contact gardner@gunthorp.com. Classes at Island Lake start at 11am to 4pm on Saturdays or Sundays at 5050 Otter River Road, Duluth, MN 55803 for $100. Space is limited and they take less time with personalized attention. Guns, ammo, hearing and eye protection are provided free. You may wish to eat an early lunch before the class, and you may bring your own beverages. Bring footwear suitable for a short walk in the woods and clothing for the weather. 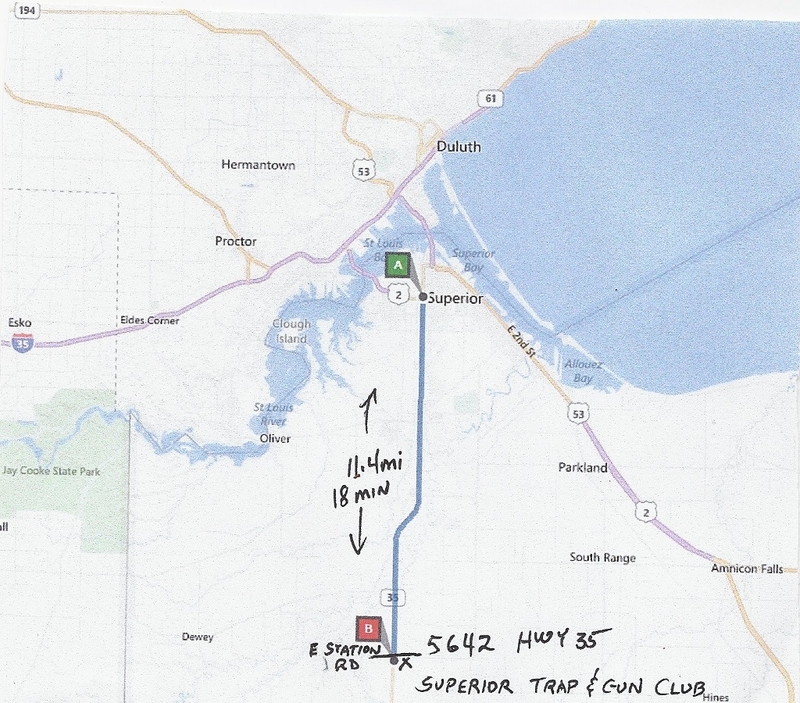 From Duluth, follow Rice Lake Road (#4) north 12 miles from Martin Rd and the Sunset Lounge. Just past the Island Lake causeway and Island Lake Inn, turn left onto Boulder Dam Rd (#269). After 4 miles, go straight onto Otter River Road 7 tenths of a mile to number 5050 on the left. Classes at the Superior Trap and Gun Club start at 10am to 4pm in the club classroom, 5642 State Hwy 35 South. 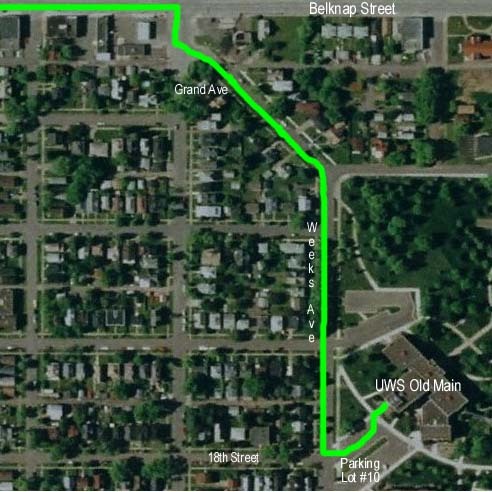 From Tower Ave and Belknap St in Superior, follow Tower (State Hwy 35) south 11.4 miles (Approximately 18 minutes.) Immediately after crossing East Station Road, turn left (East) into the club. You may bring your own lunch. Snacks and beverages are available for purchase in the classroom. All material, permit applications, protective gear, targets, 22 caliber firearms, and ammunition are provided for your convenience at no extra charge. No live ammunition will be allowed inside the classroom unless you carry under a permit honored by Wisconsin. You may bring your own unloaded 22 caliber handgun, a few rounds, eye and ear protection as well. Keep your carry and unloaded firearms with you at all times. It is suggested that you bring along a $10 donation to the club for the generous use of their facilities. You may also contact Jason Larson for reservations and information at 715-718-6033. Classes at UWS start in the basement of Old Main of the University of Wisconsin in Superior. Access to the free parking lot #10 serving the historic building’s south door is at 18th Street and Weeks Avenue, or 4 blocks south of Belknap Street and 8 blocks east of Tower Avenue. 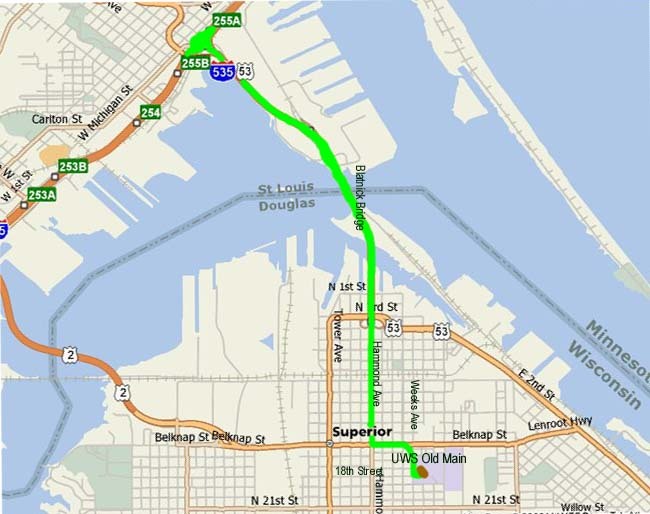 From Duluth, follow Hwy 53 South across the Blatnik Bridge to Wisconsin. Keep on going straight south onto Hammond Avenue to Belknap Street, the second stoplight. Turn left onto Belknap and go three blocks to Grand Avenue, the first light. Turn right onto Grand, then a quick diagonal left, and follow the diagonal street one block to Weeks Avenue. Turn right onto Weeks, go three blocks to 18th Street, and curl around left into the parking lot, where you will be facing the southwest main door of Old Main. Inside the building, follow the hallway northeast past the bathrooms and around the bulletin board to the stairs leading down to the basement. There will be a 45 minute lunch break around 1pm. A live fire exercise will be held in the basement shooting range for an additional $10 to help the UWS Shooting Sports Department. Expect to finish by 5pm. All material, permit applications, protective gear, targets, 22 caliber firearms, and ammunition are provided for your convenience at no extra charge. You do not need to transport firearms or ammunition into Wisconsin. No live ammunition will be allowed inside the classroom. Classes at French River start at 11am - 3pm at 5342 Ryan Road. Take the Two Harbors expressway north from Duluth. After mile marker 11 turn right towards Lake Superior onto Ryan Road (Co Rd 50) then the first driveway on the left before the RR tracks. Wear apparel commensurate for the weather; everything else will be provided.